After an excellent (if somewhat hasty) lunch, the four of us had a private tour of Palazzo Sertoli Salis, which is still the home of the Sertoli Salis family, as well as the headquarters of the winery. My photos don’t do justice to it: the palazzo is charming, rich with newly-restored tromp l’oeil frescoes cleverly designed to make the ceilings appear far higher than they are. The paintings and furniture were intended to display wealth, yet the style is somehow appealing and cozy. Some of the family’s collection of antique documents and pictures is displayed museum-style, with (unusually for Italy) explanatory text in several languages. ^ Detail of the saloncello (small salon). 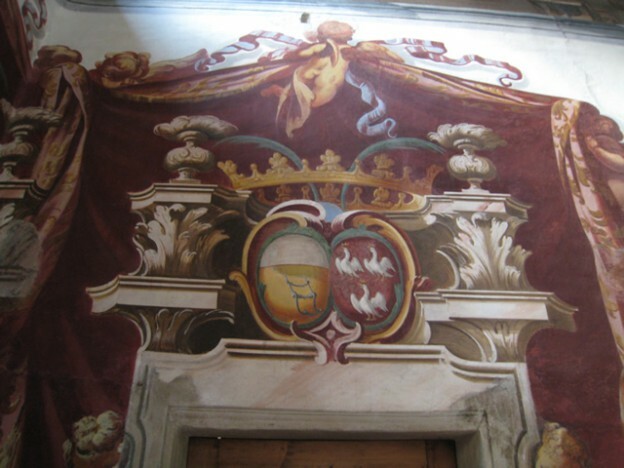 Sertoli Salis’ â€œtitledâ€ wines are named after features of the palazzo. This entry was posted in Lake Como and tagged Italian wine, Italy travel, Lake Como, Valtellina on November 7, 2007 by Deirdre Straughan.